A storage topic today. If you’re new to this blog, here is another article which shall help to study towards a Professional vSphere 6.7 Exam 2019. It’s not an official study guide, but rather a community-driven study guide which is taking shape at this page – VCP6.7-DCV Study Guide – VCP-DCV 2019 Certification. Today's topic VCP6.7-DCV Objective 7.16 – Configure and manage host profiles. Host profiles allow us to “copy” a configuration from a reference host. The configuration of the reference host, which is extracted as a host profile, serves as a configuration template for configuring other hosts. We say that a host profile is applied to that host. Follow the documentation, use your experience, study elsewhere. We’re not the only blog around. Also, the VCP6.5-DCV study guide is a good help as the objectives covered were guided by sub-chapters and as such the topics might be targetted more accurate. This does not mean that the guide we’re working on is not good… -:). We’re simply saying that nothing better than studying from multiple sources (documentation, study guides, blogs). Follow the VMware vSphere Host Profiles PDF. Requirements: vSphere Enterprise Plus license. Copy Settings from Host – If the configuration of the reference host changes, you can update the host profile so that it matches the reference host's new configuration. Export Host Profile – You are able to make an export of host profile in VMware profile format (.vpf). Note: administrator and user profile passwords are not exported. Attach/detach hosts and clusters – After creating a host profile from a reference host, you attach the host or cluster to the host profile. Remediate – Edit Host Customization. Check host profile compliance – can confirm the compliance of a host or cluster to its attached host profile and determine which, if any, configuration parameters on a host are different from those specified in the host profile. Editing a VMware host profile is a good way to do a uniform configuration change on a number of hosts within your environment. However, if you have host that has changed config and you need to update your host profile from that host, you can simply use Copy settings from host rather than Edit host profile. 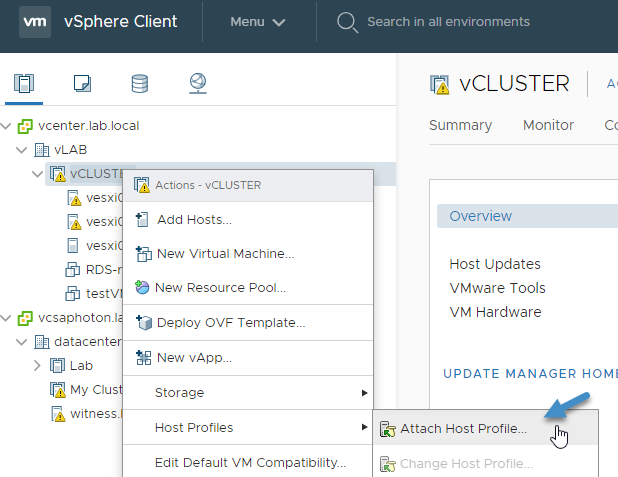 Attach VMware Host profile – Right-click the cluster from the Hosts and Clusters view > Host Profiles > select Attach Host Profile. Check Compliance – when select cluster (or host) you go to Configure > Host profile. There you have different actions, including the Check compliance action. Remediate – The remediate action is also accessible at the same menu. If host(s) is not in compliance with the attached profile, you must remediate it. Before the host(s) can be remediated, you have to edit the host customizations. Here it really depends on the changes you're doing. And after all, you perhaps not need to change anything here. So go ahead and select the host(s) using the checkbox and then select Edit hosts customizations. Once clicked, an overlay window will pop up allowing us to change things here such as IP address, subnet mask, name etc. Once you review the options here you can make changes if needed. One example could be when you've created a new vmkernel port for each host. As a result, you would need to enter the IP address during this step here. Note: you can also import a CSV file as the source for customizing host(s). And this step passed you can finally hit the remediate button. Certain Host Profile policy configurations require that the host be rebooted after remediation. In those cases, you are prompted to place the host into maintenance mode. You might be required to place hosts into maintenance mode before remediation. Hosts that are in a fully-automated DRS cluster are placed into maintenance mode at remediation. For other cases, the remediation process stops if the host is not placed into maintenance mode when it is needed to remediate a host. Please see the official documentation as well as use your home lab for the study. Follow the progress of the VCP6.7-DCV Study Guide page for further updates. We have learned about host profiles and options. 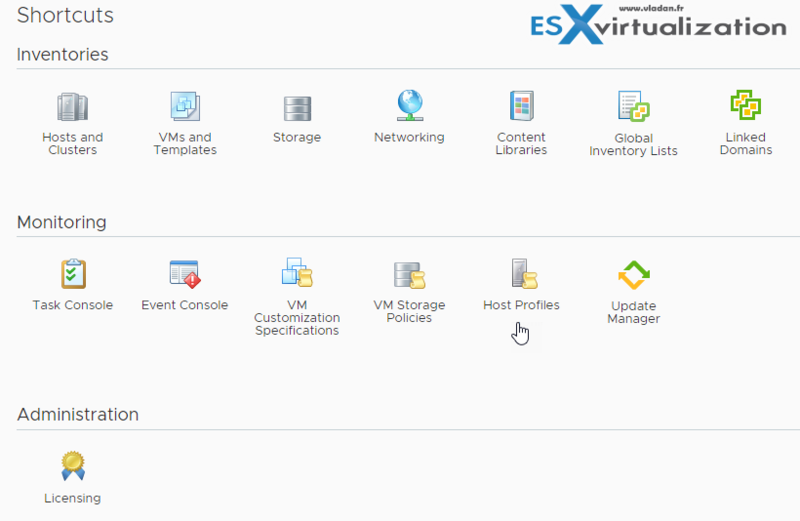 VMware host profiles are a very powerful tool for your VMware vSphere environment.